Click on this picture to see a bigger picture of me. 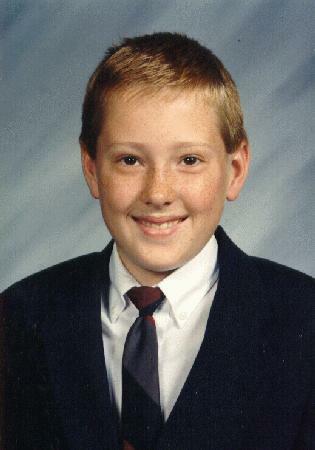 In this picture I am in 7th grade (1998-99) and play the trumpet in the band for Washington Jr. High School. 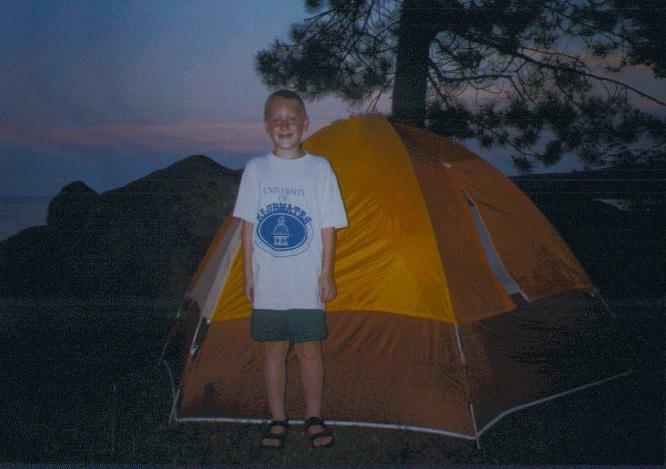 Here are my pictures from when I was younger: 1997, 1996. Note from Ryan's grandma: This section of Ryan's webpage was updated by his grandma in August, 2009. Ryan has grown up and has outgrown his webpage. He continued his interest in music and played the tuba in the high school marching band, played the tuba in the Colts drum and bugle corp, and is currently playing the tuba in the U.S. Army band. I added these updated photos above the rest of Ryan's original website, which is below. 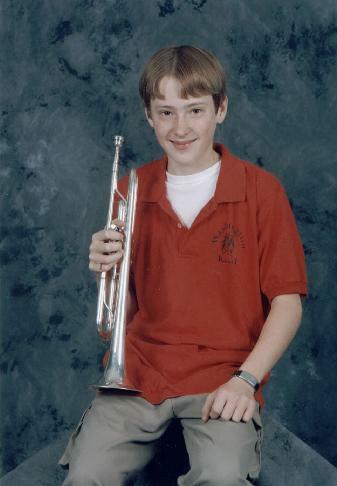 Left: Ryan as a sophomore in 2001 in his high school marching band. Right: Ryan as a senior in 2003 in the high school marching band's performance of "The Wizard of Oz" - Ryan is on the 50-yard line with the Cowardly Lion. 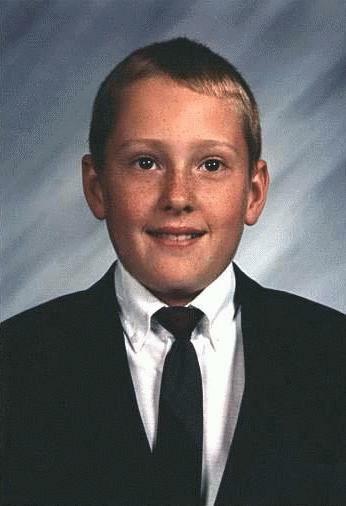 Above left : Ryan in the summer of 2006 after a performance with the Colts Drum and Bugle Corps. He took some courses at the local community college and played in the band there and in some local community bands. 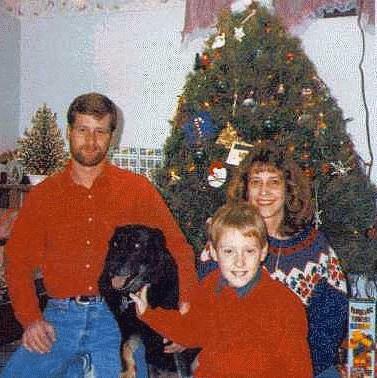 Above right: Ryan is missing from the 2006 family Christmas photo, because he joined the Army Band in the fall, so his mom is holding a figure of a soldier. Above left: Ryan made it home on leave after basic training in the spring of 2007. Above right: Ryan performing with the Army Band for Christmas 2007 in Iraq, where he was deployed for 14 months. He is in the center. Above left: Ryan playing his tuba with the Army Band. Above right: Ryan made it home for Christmas in 2008 while on leave. Above left: Ryan played in a concert in the park with the community band he used to play with while he was on leave summer 2009. Above right: Ryan summer 2009. Hi my name is Ryan. I'm going to tell you three poems. Loved the commercials he saw on T.V. deodorant to stop his sweet. And I don't like it - one bit. 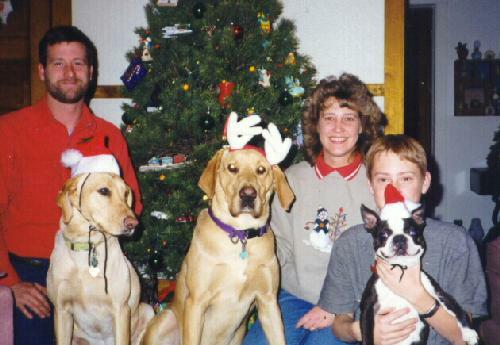 Here is a picture of my family from Christmas 1999. Oddis is the dog on the far right. Duke is the dog in the middle and Sunny is the dog on the far left. 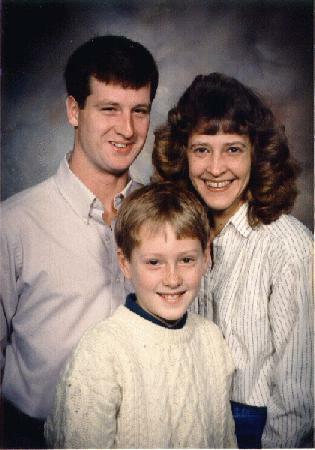 This is a picture of my family in 1996. Click on this picture to see a bigger picture of us. This is a picture of my family a few years ago. Click on this picture to see a bigger picture of us. I received e-mail from all 50 states, 1 territory, and 59 countries! I received my 700th e-mail from the U.S.A. - it came from Oregon!!!! Note from Ryan's Grandma: Ryan is no longer updating his lists of states and countries. Thanks to all of you who sent him e-mails. If you want to send him a message, I'll see that he gets it. Thank you for leaving me a message, so I can add your state or country to my maps and list! 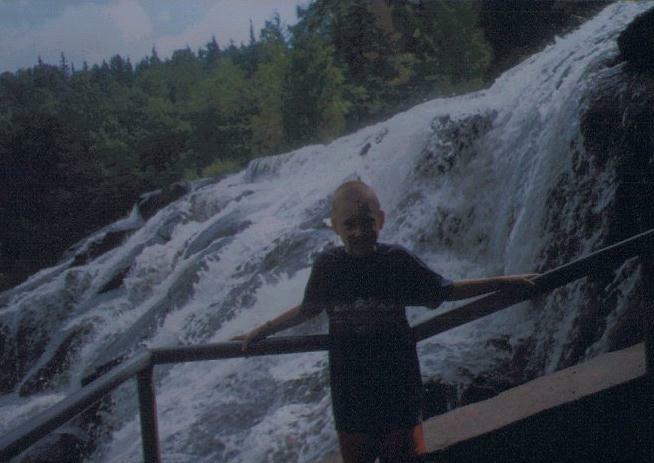 I took a trip to Upper Michigan with my grandma in 1996. Here is the journal I kept and some pictures from the trip. Click on the pictures to see a larger picture. Bond Falls: Maw and I saw a snake and a lot of waterfalls. The water there was cold. There were a lot of rocks there. I found three rocks and brought them home with me. I also found a little frog. I had fun there and hope I come again. I swam in Lake Superior with the raft. I built a sand castle. Maw and I went to Deer Lake. The water was warm and I got out a blue boat that Great Grandpa made. Maw and I slept in the rain with the tent. Maw made a camp fire and we roasted hot dogs and marshmallows. Saw the moon on the water. I played on the beach a lot and the water got really high. We went to Deer Lake and Man-Made Lake and we saw 9 road toads and 1 turtle. We ate at Deer Lake and swam there with the raft. We saw 15 big fish and took a walk. We ate at Brownstone and I made a brown stone. We slept in the tent. We went to my Great Grandma's and ate at a park. The car alarm went off. We walked on the breakwall and saw trains on the ore dock. The water there was really high. We went to Pebble Beach and skipped rocks and saved them. We went to Deer Lake. We saw a frog at Deer Lake and Maw said "It's dead" and she stepped on it and it moved. We made another fire and skipped some more rocks. Today is our last day in camp. Today Maw, Da and I ate ham and eggs on the picnic table. After that we went to Canada! In Canada we went to a airplane museum. After that we went to a touring boat. Then we ate and left. We're driving back now. Maw got some ice cream. It was Mackinac Fudge. 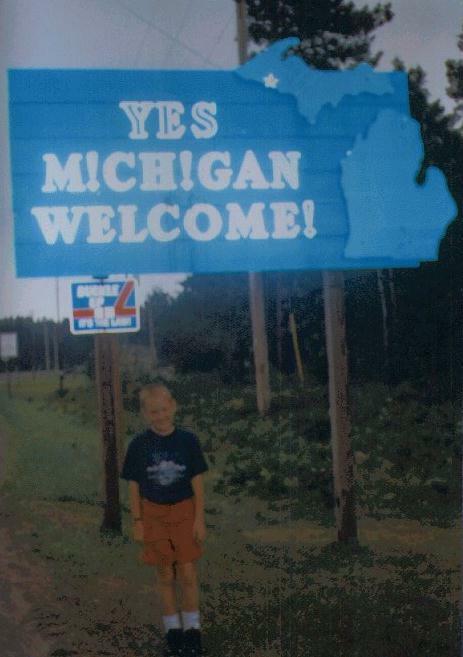 This was my trip to Michigan. I took a trip to Upper Michigan with my grandma. Here is the log I kept of the trip. You can email me in care of my Grandma at dmmaki@MichelesWorld.net . Page last updated 16 Aug 2009.